Oklahoma quarterback Baker Mayfield drove a stake-or an OU flag, to be exact-into Ohio State's field after his team beat the Buckeyes last season. He is also staking a claim to the Heisman Trophy, although Lamar Jackson remains the favorite. On the NFL gridiron, meanwhile, the AFC South once again looks like a jumbled mess. Lamar Jackson, Louisville (+160) - What is Jackson doing as an encore following his 2016 Heisman Trophy-winning campaign? Setting records, of course. The junior just became the second player in FBS history-and first from a Power 5 team-to throw for 300 yards and run for 100 yards in back-to-back games. 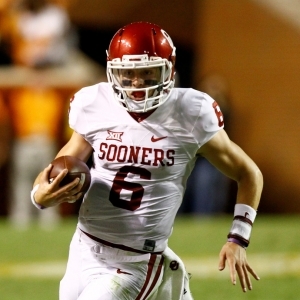 Baker Mayfield, Oklahoma (+330) - Mayfield finished third in last year's Heisman voting behind Jackson and Clemson's Deshaun Watson. The senior is doing his best to keep up with Jackson this season, passing for 715 yards and six touchdowns without throwing an interception through two convincing wins by the Sooners. Sam Darnold, USC (+500) - Darnold does not have the athleticism of Jackson or the experience of Mayfield. And so far he doesn't have the numbers, either. The Trojans' sophomore signal-caller has four touchdown passes and two interceptions through two outings. But he tossed all four of his scoring strikes in a big victory over Stanford. Saquon Barkley, Penn State (+800) - Barkley has not gotten a ton of touches because the Nittany Lions have been blowing teams out (Akron 52-0 and Pittsburgh 33-14). But he has turned those chances into huge numbers. The junior running back has 260 rushing yards on 28 attempts, 99 yards on seven catches, and four total touchdowns. Tennessee Titans (+165) - Big things are expected of the Titans in Year 3 with quarterback Marcus Mariota. He improved from 19 touchdowns and 10 interceptions as a rookie to 26 scores and nine picks in 2016. Tennessee, however, got off to a slow start by losing at home to Oakland 26-16 in Week 1. Jacksonville Jaguars (+250) - Jacksonville could not have enjoyed a more productive opener, going on the road to hammer division rival Houston 29-7. No. 4 overall draft pick Leonard Fournette rushed for 100 yards and a touchdown on 26 carries while also turning three receptions into 24 yards. Houston Texans (+250) - The highlight of Week 1 for Houston came during the introduction of J.J. Watt, who has raised more than $30 million in Hurricane Harvey relief. It went downhill from there as the Texas trailed the Jaguars 19-0 at the half and benched starter Tom Savage. The Watson era appears to have arrived. Indianapolis Colts (+550) - Indianapolis has never quite taken off behind Andrew Luck. But it's not really Luck's fault, because the injury-plagued quarterback is injured yet again. Luck missed last weekend's opener with a right shoulder injury, and the Colts got clobbered 46-9 at the Rams. He is out for Week 2 as well. Real Madrid (+400) -The 2017-18 Champions League gets underway on Tuesday. Real is the two-time defending champion, having defeated Atletico Madrid in the 2016 final and Juventus in this summer's title match. Cristiano Ronaldo and company are in a tough Group H along with Dortmund and Tottenham. Paris Saint-Germain (+650) - Paris Saint-Germain has never won the Champions League and never even reached the final. But the Parisians hope things are different this time around now that they have Neymar on board. PSG finds itself in a group with Bayern Munich and Celtic. Barcelona (+700) - Spanish clubs have monopolized the Champions League title in recent seasons. Real has won three of the last four, while Barcelona sneaked in there in 2014-15. FC Barca also lifted the trophy in 2009 and 2011. Lionel Messi and friends are in Group D, which is also home to Juventus and Olympiacos. Bayern Munich (+700) - Bayern has not been back to the final since playing in it three times during a four-year stretch from 2010 through 2013 (lost two then beat Dortmund). It has been cleaning up, however, at home in Germany. The Reds have captured five consecutive titles in the Budesliga. Jordan Spieth (+500) - Spieth leads the FedEx Cup standings heading into the penultimate event of the playoffs-the last one before the Tour Championship. The 24-year-old American's playoff campaign features two runner-up finishes in two events (one to Dustin Johnson in a playoff and one to Justin Thomas). Dustin Johnson (+580) - Johnson is the defending champion of this tournament, while Spieth placed ninth last year. The world No. 1 has won it twice now, although neither victory came at the course on which it is being played in 2017 (in Lake Forest, Ill.). After winning three weeks ago, Johnson was T18 at the Dell Technologies Championship. Justin Thomas (+900) - In addition to the FedEx Cup, the battle for Player of the Year is also in full swing. Thomas owns one major (the PGA Championship) and four other titles-including most recently at the Dell Technologies Championship. The world No. 4 placed T32 and the BMW Championship in 2016. Rickie Fowler (+1000) - The top five in the FedEx Cup standings control their own destiny at East Lake, and the battle for fifth place involves Fowler and Jon Rahm, among others. Fowler, who was fifth at the PGA Championship, finished T4 the last time this event was held at Conway Farms Golf Club (2015). Rahm is also a +1000 fourth choice.